Green is one of the colors I love the most, in all its shades, especially the darker ones - but why not try and wear something a bit lighter for once? I made this Elise Shawl with a linen & cotton yarn, soft and natural, just what you need for late Spring and Summer. Let me tell you, I immediately fell in love with all the shades this yarn had, they reminded me of the woods, the new leaves, the white flowers, the clouds on the top of the mountains... all the things that I love! As I began to crochet this shawl, I couldn't help but notice how these shades just "worked" with the pattern, you know what I mean? I made a very big shawl as you can see (that's me in the picture, and I'm 1.75 m tall, just to give you an idea of just how big it is), and I just love it! Il verde è uno dei colori che amo di più, in tutte le sue sfumature, soprattutto quelle più scure - ma perché non provare qualcosa di più chiaro per una volta? 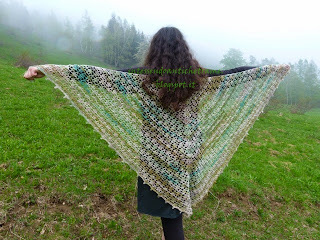 Ho realizzato questo Elise Shawl con un filato di lino e cotone, morbido e naturale, quello che ci vuole per la fine della Primavera e l'Estate. Lasciate che ve lo dica, mi sono innamorata delle sfumature di questo filato, mi ricordavano i boschi, le foglioline nuove, i fiori bianchi, le nuvole sulle cime dei monti... tutte le cose che amo! Appena ho iniziato a lavorare allo scialle mi sono accorta di come queste sfumature fossero adatte allo schema. Ho realizzato uno scialle molto grosso, come potete vedere (sono io nella foto, e sono alta 1.75 m, tanto per darvi un'idea), e lo adoro! Lovely shawl , Valentina !!!!!!! I fell in love with it !!!!!!!! A really beautiful shawl you had made !!!! You did a brilliant job. I have made 5 Elise shawls and love them, well I sent them all away as gifts. It is a great pattern, yours is amazing. Incantevole il tuo nuovo scialle sembri una fata nei boschi! !Stupendo lo sfondo...meravigliosa natura! !un bacione!! The Elise Shawl is certainly pn my to do list and yours looks sooo wonderful!! OOh beautiful Valentina - loving your shawl collection! Looks so pretty! Extremely beautiful .... great work in it ! Have a nice weekend !